Topeak has certainly hit on a nice concept by integrating lights into their Aero Wedge saddle bag, but are they worth the extra cost? The Topeak iGlow saddle bag takes its place among the rest of the brand’s iGlow range, which currently consists of two mudguards and a mini pump. What’s special about this range is that Topeak has its standard products and integrated them with LEDs in order to increase visibility. But what actually most impressed us was that behind the headline LEDs, this is fundamentally a very good saddle bag. 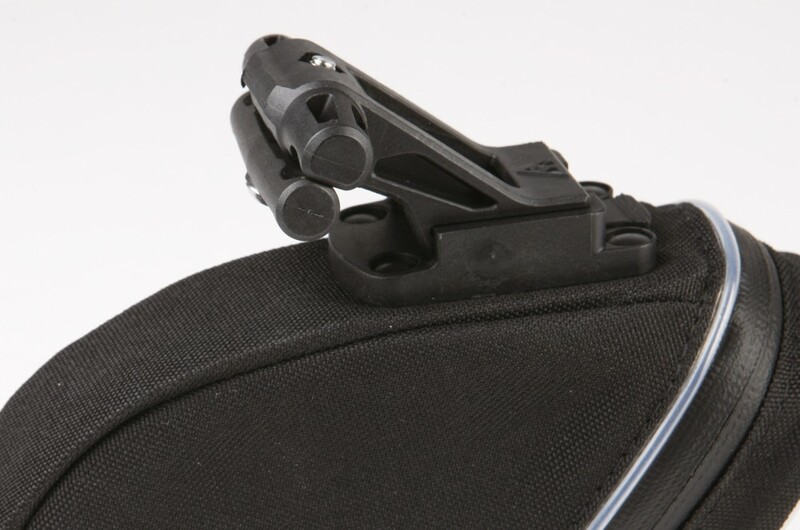 The Topeak iGlow saddle bag is secured using Topeak’s QuickClick system – a similar concept to the system used by the Fizik Take saddle pack, just executed with a little more success. The QuickClick system means that instead of the usual straps which you wrap around the saddle rails and the base of the bag, the main body is simply clipped into a small bracket which is bolted onto the saddle rails, with the front then attached to the seatpost with a Velcro strap. The benefits of this are threefold: firstly, the saddle bag is exceptionally easy to attach and detach, even in gloves; secondly, it is held firmly in place, with no swaying from side to side and bashing against the insides of your thighs; and thirdly you can use same clip to hold other Topeak accessories, such as their range of Redlite rear lights. If there’s one problem with the QuickClick system, it’s that the bolt which fits to the saddle rail needs to be fitted to the horizontal part of the rail, meaning that if you have your saddle pushed all the way forward it may not fit. Topeak currently only offer the iGlow version of the Aero Wedge saddle bag in a single size, which comes with a 0.8l capacity, the equivalent of a small for any existing Aero Wedge disciples out there. This is by no means the biggest saddle bag in the world, but is more than adequate, and we could comfortably fit two innertubes, a mini tool, chain breaker, and a set of tyre levers inside. A little bit of space is taken up by the two CR2032 batteries needed to power the light, but not enough for us to complain about. But onto those red LEDs, which are the apparent big selling point of the Topeak iGlow saddle bag. Topeak don’t offer figures on the brightness of the three LEDs which are integrated into the rear of the saddle bag, but we certainly wouldn’t feel comfortable heading out after dark without a good dedicated rear light such as the Exposure Blaze. However, the iGlow could be a useful backup for when your main lights fail as the blinking and constant modes work well, and can easily be switched between by pressing the back of the bag. The claimed 50 hour run time is also good. However, there’s the small, or not so small, matter of the price… The addition of the LEDs means that the Topeak iGlow saddle bag will hit your wallet twice as hard as the standard model. There’s no escaping the fact that £36.99 is an awful lot for a relatively small saddle bag, especially with the main selling point coming up short of the mark. A very good saddle bag with a clever QuickClick system. The LEDs are a nice touch, but its an expensive addition, costing twice as much as the standard version.